Now, in principle I should have always been fond of barefoot sandals. In general they look like normal sandals, usually with a bit of ‘bling’ or fancy designs, but importantly they have no sole (hence the name – they’re more akin to foot jewellery than sandals). Whereas often with sandals/flip-flops there’s a strap going over the foot, between the toes, that connects to the sole, with barefoot sandals the ‘strap’ (usually a long piece of cord or thick string) loops around a toe, and then ties around the leg just above the ankle. The reasoning behind why I’d wear them is twofold – they make my feet look less ugly whilst giving the impression that I’m not barefoot at all, but rather just wearing some thin sandals. I also have this thing for daisies (I’m not sure why, but it might be something to do with the fact they’re one of the few things I can draw/doodle! ), so I’m naturally attracted to that kind of design – I’m basically a wannabe hippie! 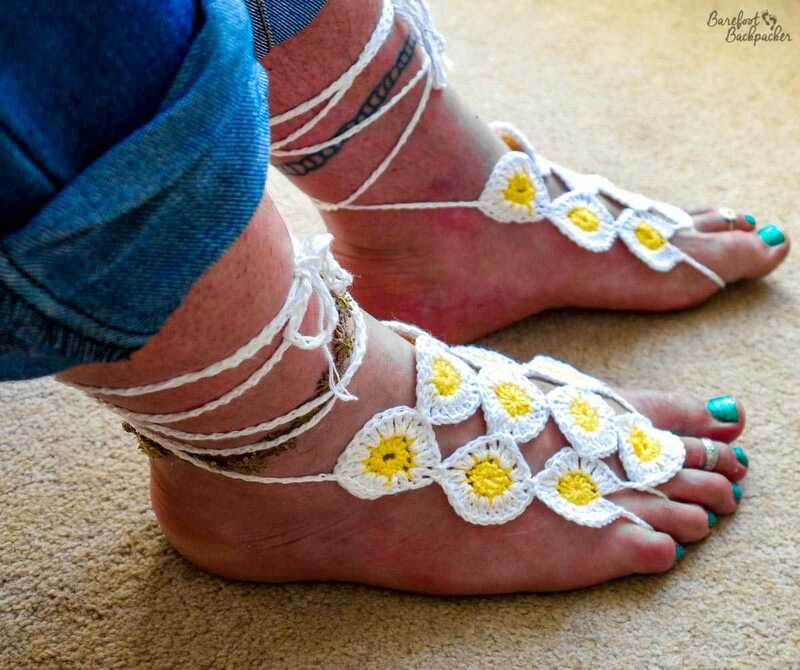 Traditional ‘barefoot sandals’, definitely very ‘bare’ and more akin to foot decoration. Searching online, via Pinterest, didn’t bring anything up I liked, but then I had a chat with a friend who said that one of her friends (Mrs Blake’s Makes) might like the challenge, as long as I didn’t mind crochet again. After a few e-mails, and a tracing of my feet onto squared paper, she said she’d completed them. Close-up of the new barefoot sandals. This is what they would look like if someone saw me wearing them on the streets. 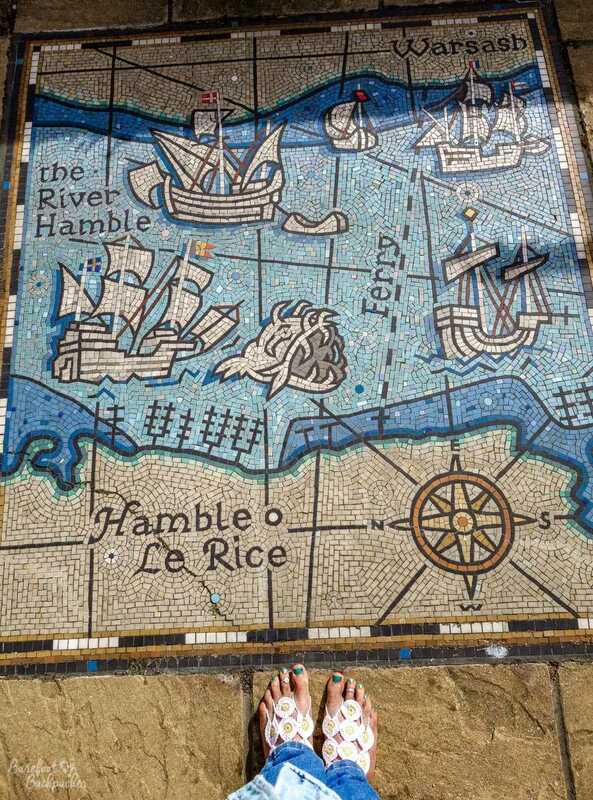 I’m at a mosaic in the Hampshire boating port of Hamble. This was the end result. The strapping is made with a thicker cord than the sandals I previously had, and they have a little more weight behind them, which means they stay on my feet pretty well – I wore them for the whole of the wedding weekend, and never had any problems with them. The daisies over the forefoot are unusual, and meant there needed to be two toe loops rather than one to ensure that they keep their shape when I walk. 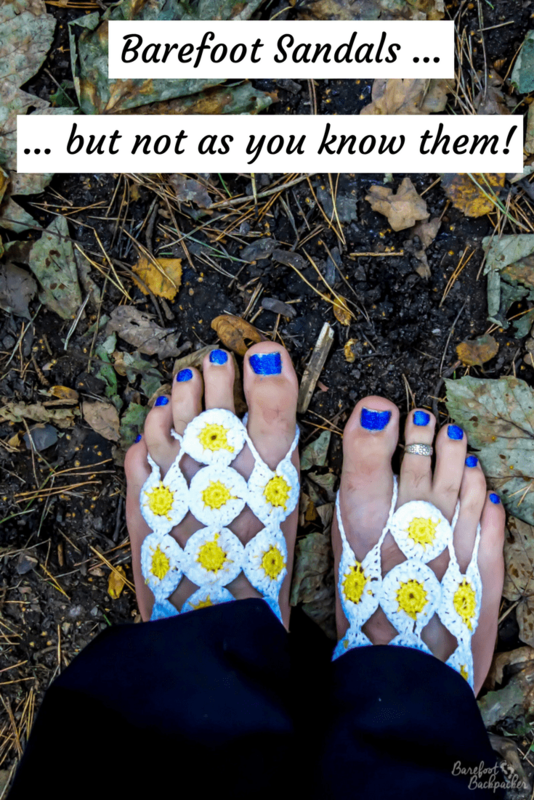 That there were so many daisies crocheted meant that a few people at the wedding were fooled – I was complemented with “nice flip flops”; when I showed them they had no soul they were impressed and would never have guessed. (I was wearing jeans for much of the day – it’s more obvious when wearing shorter trousers, when they look a little like old gladiator-like sandals). They’re very comfortable, are easy to slide on and off, and fit perfectly. They even felt like I was wearing proper sandals. 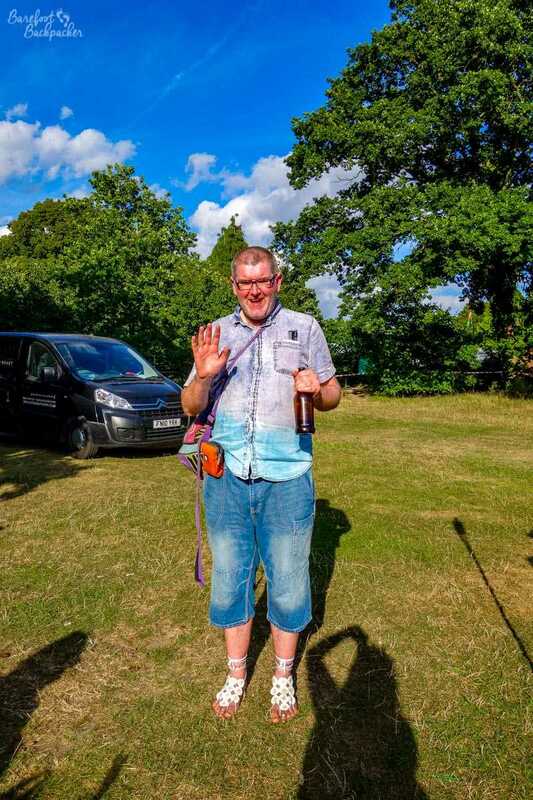 At the wedding reception in the country park – here seen with the long shorts rather than the full-length jeans. I did get a few stares when walking through the streets of Southampton and London in them, but that was more due to the daisies than the bare feet – even though I was still a little self-conscious about them, no-one questioned my lack of footwear at all, and I went through some busy areas, certainly in London (including the South Bank and Brick Lane areas). Like this post? Pin it! !